Instruments: Valencia 3/4-scale Classical Guitar (modified to Bohlen-Pierce scale), FL Studio 10: Convolver plugin + bass and triangle samples. For a while, I've been meaning to try composing music in the Bohlen-Pierce scale. Using FL Studio, I had previously been able to modify synthesizers and sample-based instruments to the scale, but since my primary instrument is guitar, I found it difficult to compose using those (somewhat artificial-sounding) keyboard-based instruments. After running across a video on YouTube showing that you could use zip ties to create temporary frets on a defretted guitar neck, I decided I felt comfortable enough to buy a cheap guitar and perform the operation to turn it into a Bohlen-Pierce guitar. 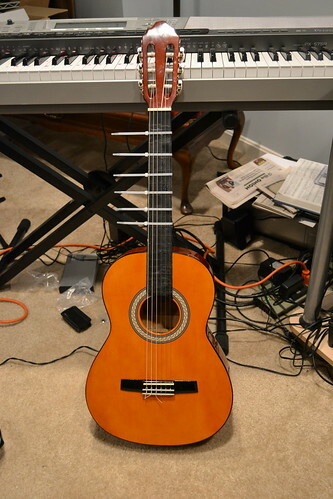 Note that I chose a 3/4-scale classical guitar, knowing that a) the frets would end up further apart after the operation, and b) nylon strings have a smoother tone, which ought to make the unfamiliar notes of the scale easier to digest. Having done that, I could now jam on the guitar to come up with Bohlen-Pierce chords and riffs that suited my taste. The present instrumental is my first attempt to bring together chords, a bass line, and a melody into a listenable Bohlen-Pierce track. Stay tuned for a variation of this track with lyrics! Posted by Kex 5 comments - add yours! Instruments: FL Studio 10: Convolver plugin, Open Instrument Cable, Tambourine Sample, Hofner Bass Guitar Sample, 12 String Guitar Samples. No organic instruments were harmed in the making of this track. FL Studio has a plugin called "Convolver", which loads an audio sample and triggers it continuously according to the levels of an input sound source. In this case, I used tambourine, bass, and 12-string guitar samples as the samples to be triggered. For the triggering sound source, I used an open-ended instrument cable, tapping rhythmically on the end with my finger. When you have the cable plugged into an amp, this creates an abrupt buzzing noise which stops as soon as you let go of the end. It was this staccato buzzing that triggered the samples. Variations in impact force and friction created variations in the final sound of the samples. For the chords being played, I ran together an octave's worth of separate Convolvers with 12-string guitar samples and mapped the notes to a MIDI keyboard. I fudged the chords with one hand while triggering the samples with the instrument cable in the other hand. It was fun. P.S. The "rain" and banging/thunder/explosion sounds were produced the same way as everything else. Just, like, different samples. Secret percussion samples. Instruments: FL Studio 10: Convolver plugin + vocal sample and electric guitar. FL Studio has a plugin called "Convolver", which loads an audio sample and triggers it continuously according to the levels of an input sound source. So here, the sample I am triggering is an old (like, 2003 old) clip of me singing a Weird Al song, "Since You've Been Gone", backwards, backwards. That is, I took the line "Well I'm feeling like I stuck my hand inside a blender and turned it on", listened to it backwards, sang that, and turned the result backwards, arriving at a really goofy sounding version of the original. The words "blender and" came out sounding more like "dunderhead! ", thus the name of this track. The input source for this track was an electric guitar (now I can't remember whether it was the Kramer Focus or the Epiphone Wildkat; I'm leaning towards Kramer Focus). I just jammed out whatever popped into my head. The more trebly and staccato notes result in more obvious triggering of the speech sample; however, the sample really is triggered by every note, which is why there's so much ambient "reverb" and glitchy effects. P.S. If you know where I might have ripped off the main chord progression from, let me know. I keep thinking it reminds me of Harry Potter music.